If you have ever researched ways to make money online or the best work from home jobs, you will find that freelance writing is a commonly recommended suggestion. Flexibility and the ability to set your own hours. A constant need for content creation – the content marketing industry is estimated to be worth 412 billion dollars by 2021. The ability to enhance your resume, learn new skills, and develop a network of clients and businesses you work with. Personally, I always recommend content writing or freelance writing gigs whenever I am asked the question about the best ways to make money online. I’ve also been involved on and off with content writing and freelancing for the past few years. From writing 500 word articles on medical disorders for businesses to writing several thousand word blog posts for individual clients, I think I’ve covered a decent range of ways to make money by writing. Additionally, I also run This Online World, and I’ve recently been experimenting with writing on Medium to make money, with some initial (albeit humble) success. Granted, I do not work as a freelance writer full time or make my living by working online. I am finishing school, and I have a full-time job. However, I have always found it relatively easy to secure contract work, freelance writing gigs, and I know where to look to make money online. Since getting started with freelance writing work can seem like a monumental task and is difficult for some, I thought I would share my opinion and tips for those looking to start. I’ve mentioned how to find freelance jobs and make money from home in my post on the best side hustles in college, but I want to expand on the subject. So, what will this post contain? A quick discussion about the ‘going all in’ mentality. Setting your goals and find your space as a freelancer. How to build a freelance writing portfolio. The best websites and marketplaces for finding freelance writing gigs. How to approach clients or companies as a freelancer. Some basic tools, resources, and skills you are going to need. I want to preface this entire guide with a quick note. Everyone who is looking to become a freelance writer to make money online is going to have a different level of urgency. I want this guide to be thorough: I am going to cover all the steps you need to get started. By this, I mean I am going to assume you have time to create a portfolio, search through a variety of job marketplaces, and find the best offers that suit your price point and experience level. Additionally, I’m also assuming you aren’t immediately going ‘all in’ on becoming a freelance writer (and that you have another source of income/job and are simply looking to gradually make the change into freelancing full time). If you are immensely strapped for cash and don’t have time to create a portfolio or engage in a selective freelancing job search, I would advise putting together whatever sort of portfolio you can muster and bulk apply to job sites (which I will cover shortly). 1) What is your Ultimate Goal? Do you want to become a full-time freelance writer, or write occassionally to make some extra money online? 2) How much Money do you want to Make? This relates strongly to the first question. If you want to replace your current full-time income, you will almost certainly have to freelance write full-time. If freelance writing gigs are just a side hustle and you want to net a few thousand dollars a year, you can dedicate a few hours per week into your freelancing work. 3) How Soon do you Need the Money? As mentioned, everyone has a different level of urgency. However, your timeline will also impact how picky you can be when selecting jobs and pay rates. If you need the money tomorrow, be prepared to write anything and everything that you can find. When it comes to finding your freelance writing area of expertise, there are also a few things you need to consider. Firstly, you should examine your own skill set, knowledge base, and writing ability. However, you should also consider the landscape of the advertising and media industry. Here’s why: the majority of your stable freelance writing gigs (and the highest paying ones) will come from companies or serious bloggers looking to monetize a website, not hobby bloggers or small businesses. There are exceptions, but generally, securing long term contracts as a freelance writer means you are part of a content marketing effort for a magazine, media company, or business. 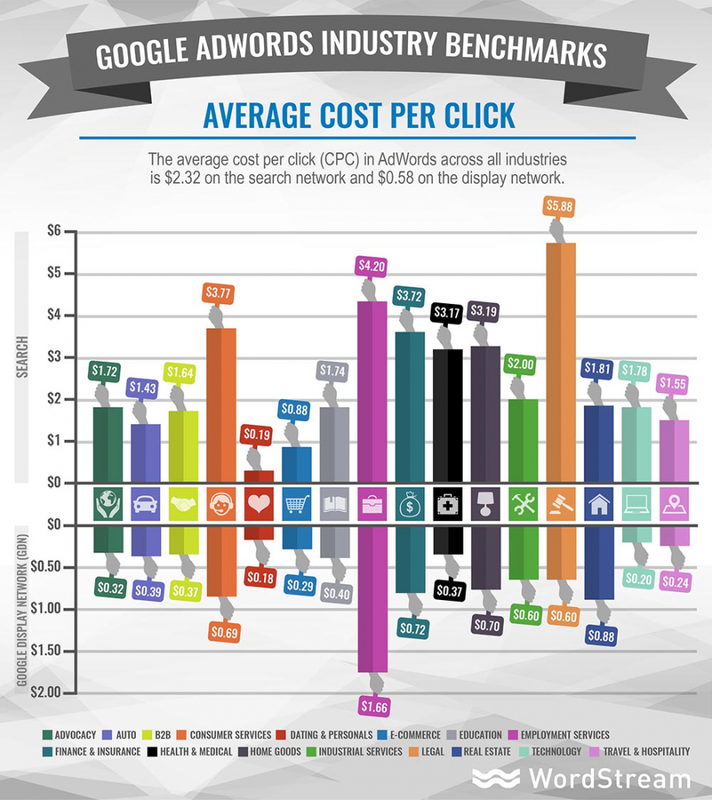 These are Google AdWords industry benchmarks for advertising costs per click. This graph really provides a simple way to understand what the most expensive industries are and where the money is in advertising. If you want to freelance write full-time, merging your own personal skills and knowledge with a lucrative industry makes sense. So, when branding yourself as a freelance writer, don’t be afraid to remain broad. You aren’t an expert writer about some rare medical disease no one has ever heard of; you’re a highly qualified writer in the health and medical field. Determine your skill set, pick an area you want to work in, and get ready to become a freelance writer! Note* you don’t have to just stick to one field, but if you are an expert in a field, you can (and should) charge more for your writing in that particular niche. Most freelance writing jobs will request a portfolio of your previous work, and this is generally impossible to ignore or circumvent. If you have already written content as a freelance writer, your work is already available so your portfolio is ready (these days, most job posting just need a URL to view some of your work). However, if you have never written content before, you’ll need to put in a bit of work. If you are pressed for time, starting your own blog might not be the best idea, so stick to Medium. However, at the end of the day, you need a platform where you can create a portfolio and display your work. This is where writing on Medium is a great idea (just remember to leave your portfolio articles free for public viewing and not listed as ‘Member Content’). By sticking to your own platform, you can approach publishers and freelance contracts with more than just articles. You’ll have stats, readership metrics, a platform to market, and you can even make some money in the process. So, create a Medium account, and get writing! Since you know the general area you want to write in, crank out 1-3 articles on something you are passionate about. Want to freelance write about technology? Write an incredible series of articles on Medium about the latest trends in the world of technology. Once you have created your portfolio, you’re ready to start hunting down some freelance writing gigs! I’m going to list a few of the best freelancing job boards and websites, as well as some benefits each platform presents. First, I want to start with Indeed. Indeed is always my go-to job posting board when I’m hunting down freelance writing gigs, SEO projects, or even career opportunities. In my opinion, Indeed has some of the best job search filtering options, quality postings, and general ease of use compared to a lot of platforms. Many people will disagree with me on this, but Indeed attracts quality companies and allows applicants to apply for jobs through the web browsing interface. Additionally, you’ll find the freelance writing marketplace to be quite bountiful on Indeed. You can even sort by full-time or contract work, as well as search for in-house or remote freelancing opportunities. Ultimately, Indeed can make your job hunting process rather efficient. Just make sure your resume is up to par! 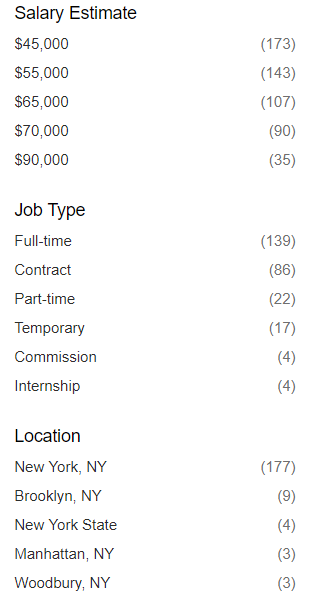 If I can’t find freelancing opportunities on Indeed, LinkedIn is always my second choice. LinkedIn is one of the fastest growing media platforms with more than 500 million users as of Q4 2017. LinkedIn is an incredible B2B platform, but it also presents a lot of handy opportunities for securing freelancing contracts. Aside from the fact that you can apply to organizations where your contacts currently work, you can also use LinkedIn as a job search engine. I generally find fewer freelance job results when searching on LinkedIn, but the filtering options and ability to network with businesses and professionals are benefits. Current employees from your network. Part-time, temporary, or full-time opportunity. Additionally, you can also use LinkedIn’s job search alert to receive daily or weekly email alerts to inform you when new jobs that match your criteria are posted. 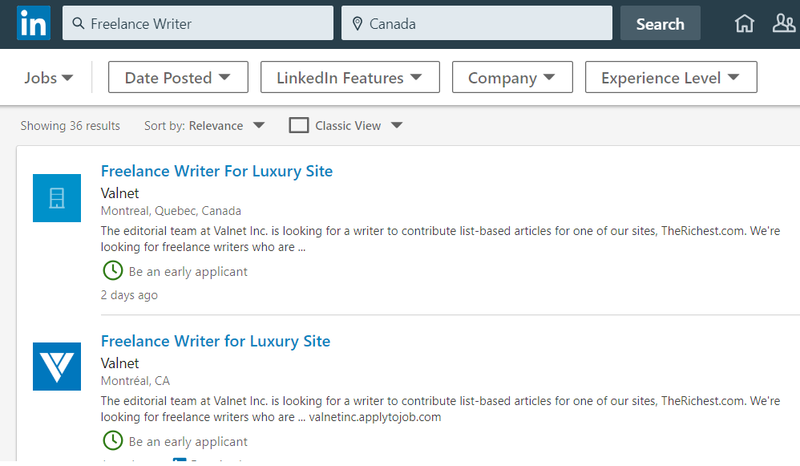 Ultimately, LinkedIn is a powerful platform that can assist freelance writers secure jobs and establish new connections. Ah, we have returned to Reddit. I mention Reddit quite frequently on This Online World, but that’s because Reddit is a fascinating community and presents vast opportunities for businesses, marketers, and everyday people. It’s an active community with 90,000+ members. There are minimum wage rules, a testimonial/review system for freelancers and employers, and some high standards for post quality and descriptions. You can find jobs to supplement your freelance writing career or to even establish it; ForHire is great for finding both short and long term projects to work on. Look at this post. It has all the information any freelance writer would need to get started, and you don’t have to deal with HR nonsense or extensive interviewing. You just apply, backup your application with writing samples, and next thing you know you’re getting weekly PayPal payments for your content writing. It truly is that simple. If you’re a talented writer and you have a portfolio, definitely consider using Reddit ForHire to search for freelance writing opportunities. I’m going to keep the remaining job websites in this list brief since I have limited/no experience with most of them. I also recommend sticking to 2-3 job searching websites to start with to prevent being overwhelmed. However, I still think these platforms can assist freelance writers in expanding their network of opportunities and help them to earn more income. Upwork – massive marketplace, wide range of jobs, 20% fee per job completion. Freelancer – 14.1 million jobs posted, both writers and employer pay an hourly project fee (usually 10% or $5.00, whichever is greater). PeoplePerHour – 1 million+ workers, 15 free bids per month as a freelancer, 20% fee per job completion. iFreelance – Monthly fee of $6.25-$12, but no commission for your completed gigs. There are plenty of other marketplaces to find freelance work, but I’ll end the list here. I disagree with a lot of the options they listed (like Listverse), but there are some solid recommendations and it can demonstrate the true breadth of the freelance industry. However, I believe Indeed, LinkedIn, and Reddit are your best options. All 3 platforms allow you to avoid fees, monthly subscriptions, and you can find a wide variety of freelance work that suits your personal needs and goals. Trust me, start out with those 3 platforms and branch out if you need to find additional work. Remember the 3 questions (ultimate goal, income desire, and time-frame) you need to ask yourself before starting to freelance? Well, these questions are also integral to how you approach freelancing opportunities and secure work. How much money do you charge per article (or for the given article at hand)? What is your strict turnaround time. Whatever you decide, write it down. Having a mental frame is not good enough. I’ve accepted content writing gigs before because they ‘sounded fair’ only to realize I just signed myself up for writing at a $6/hour rate because I bit off more than I was ready for. If you’re applying to a job posting, a lot of the expectations will thankfully be covered by the employer. However, in more informal marketplaces (Reddit) or in the process of independently reaching out to organisations, you need to know your stuff. You also need to be authentic and concrete. I can IMMEDIATELY tell this is an email copy-paste blast. He doesn’t know a thing about my website, he is only pretending to. The articles he linked as a reference have no relevance to my niche. He doesn’t state his price, turnaround time, or any metrics that make me want to work with him. When you decide to pitch your freelance services or fight for a job, you need to stand out from the crowd. Actually research the company you are pitching to, and ensure they are relevant to your field of writing/your abilities. Assert your expertise and outline why and how you will bring value to the company you want to work for. Use screenshots, stats, and any form of proof you have to build your pitch. State your price range, turnaround time, and any other requirements you have. Let’s take the Reddit ForHire post from above as an example (the one on content writing for watch and dart websites). This pitch outlines the value I provide, my credentials, my requirements, and what my potential employer should expect. Ultimately, when you spend time trying to secure freelance writing jobs, this is the route I advise you to take. Don’t email blast, copy-paste, or spam your way into finding job offers. Take time to craft individualized job applications that are tailored to the needs of the company/individual you are working for. In fact, my email pitch might even be a touch too formal for a Reddit pitch…but you get the concept. Do your research, take an extra 5 minutes to make your pitch the best one out there, and only apply for freelance writing jobs that fit your knowledge and abilities. Alright, I’ll try to be brief once more with these tips. Setup a PayPal account and understand how to use it and receive/send money. This is how some of your freelance work will be compensated. Forget expensive software and stick with what works best for you. Use Excel, an agenda, and both a physical/digital calendar to keep your freelancing work organized. This is all you need. I don’t use Grammarly or editing software, but it doesn’t hurt. Purchase writing software based on your needs. If you decide to offer image sourcing as part of your freelance writing service (this is rare, but some companies don’t mind it), you need to make sure you only use royalty free images that are open to reuse without modification. Personally, I use Pexels and Pixabay for my free stock photo needs. For editing, I keep things simple and rely on Canva and Design Wizard. As I mentioned earlier, the value this guide provides largely depends on the time-frame and goals of the reader. If you need to make money starting tomorrow, then you need to sacrifice your ability to be selective. Similarly, if you just need to find freelancing work to earn an extra $50 every 6 months, you can probably tone down the seriousness of all this. 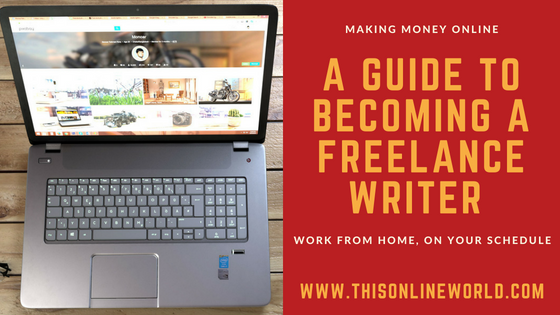 However, if you are looking to make a decent wage and annual income from freelance writing, I hope this guide provides some assistance. At the end of the day, your authenticity, effort, and willingness to hustle can make freelance writing a viable source of revenue. Just remember to know your goals, abilities, and treat your writing service as you would treat any other business/profession. Best of luck in your freelance journey! What a great post. Very informative. Thanks. Thank you for this excellent and very practical post. I read it several times and am convinced that following the steps you delineate will bring success as a freelance weiter. The effort you put into this post is really impressive. I can say you really love writing. Thanks for sharing ♥️ ♥️ By any chance you are interested on doing collaborations, you can check out the collaborations portal of Phlanx.com and connect with amazing brands!